Color photographs and negatives of textiles produced by Missouri artisans for the Concordia Project. 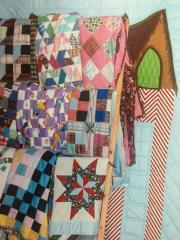 Includes crochet and tatting, cut work and embroidery, quilts and quilting, rag rugs, and weaving. Also includes miscellaneous files and audio cassette interviews. According to the grant application, which appears in the State Historical Society of Missouri's collection CA5536 SCHROEDER, ADOLPH E., PAPERS, the purpose of the Concordia Project is to "1) to assist the Concordia community to document surviving German folk traditions, including practices and customs, music, verbal lore, both in high German in the local Hanoverian low German dialect, and building, textile, and other craft traditions. One aspect of this phase of the project will involve fieldwork to record stories, music, and songs and locate and document examples of cultural transference of German craft traditions. A second aspect will involve assisting the local museum director and volunteers to interpret the large collection of photographs, documents in German, Textiles and other objects in the museum. 2) To plan and develop a traveling photographic exhibit and a 15-minute videotape through which the community can share its heritage with its younger generation, other German communities, and Anglo-American neighbors. 3) To prepare a series of public programs relating to the cultural life, dialect and verbal lore, and textile and other craft traditions in Concordia"
Quilts by Clarence Ehlert of Concordia, MO documented for the Concordia Project. Photo by Laurel Wilson, project fieldworker.